When a project attracts the likes of Hollywood power players such as Kate Winslet, Hugh Jackman, Halle Berry and Richard Gere, you might expect it to be the stuff of awards season greatness. But in the case of “Movie 43,” these stars and a slew of other recognizable faces are just looking for a little raunchy fun. Featuring vignettes from 12 directors including Peter Farrelly, James Gunn, Elizabeth Banks, Brett Ratner and Bob Odenkirk, “Movie 43” is a series of ridiculous, intertwining stories that serve to shock, offend and incite laughter through all the awkward discomfort. The movie’s impressive ensemble cast includes Halle Berry, Elizabeth Banks, Kristen Bell, Leslie Bibb, Kate Bosworth, Gerard Butler, Bobby Cannavale, Kieran Culkin, Josh Duhamel, Anna Faris, Richard Gere, Terrence Howard, Hugh Jackman, Johnny Knoxville, Justin Long, Jack McBrayer, Stephen Merchant, Christopher Mintz-Plasse, Chloe Moretz, Chris Pratt, Liev Schreiber, Sean William Scott, Tony Shalhoub, Emma Stone, Jason Sudeikis, Uma Thurman, Naomi Watts and Kate Winslet. 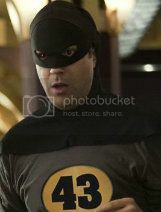 “Movie 43” hits theaters Jan. 25. Um … what did I just watch? What a waste of an amazing cast! I need to see this for the cast.